I made my San Joaquin Sourdough today with a couple of modifications. The last few bakes, I have substituted a liquid levain for the the firmer levain and also have used a higher percentage of levain, although, since I've used a liquid levain, the percentage of pre-fermented flour in the dough is actually lower. Also, note that, while the “final dough” hydration is 72%, the total dough hydration is actually closer to 78% because of the high-hydration levain. This is actually a somewhat higher hydration than my original formula for San Joaquin Sourdough. The second modification was to cold retard the dough for a longer time – 36 hours as opposed to the 16-20 hours I have generally used. This was for my convenience, but I've also been curious about the effects of longer cold retardation on this dough. Mix the liquid levain (1:5:4 – Starter:Water:Flour). Let it ferment at room temperature for 12 hours. Pour the water into a large mixing bowl. Add the starter and dissolve it in the water. Add the flours and mix to a shaggy mass. Cover tightly and let it sit for 20-60 minutes. Sprinkle the salt over the dough and mix thoroughly using the “stretch and fold in the bowl” technique. Let it rest for 30 minutes. Repeat the “stretch and fold in the bowl” for 30 strokes 2 more times at 30 minute intervals. Transfer the dough to a lightly floured board, and do a stretch and fold. Return the dough to the bowl and cover. After 45 minutes, repeat the stretch and fold on the board. Reform the dough into a ball and replace it in the bowl. Allow the dough to continue fermenting until the volume has increased 25%. Cold retard the dough for about 36 hours. Take the dough out of the refrigerator and immediately transfer it to a lightly floured board. Pre-heat the oven to 500ºF with a baking stone and your steaming method of choice in place. Pre-steam the oven. The transfer the loaves to a peel (or equivalent). Score them, and load them onto your baking stone. Steam the oven. Turn the oven down to 460ºF. After 12 minutes, remove your steaming apparatus. Turn the loaves 180º, if necessary for even browning. Continue to bake the loaves for another 15-18 minutes or until their internal temperature is 205ºF. Cool the loaves completely before slicing. Because I was planning on a longer cold fermentation, I refrigerated the dough sooner than I would have otherwise – when it had expanded about 25%. In the refrigerator, the dough continued to expand, but very slowly. At 24 hours, it had expanded to 150% its original volume. At 36 hours, it had doubled in volume. The dough was of about the same consistency as usual. This is a sticky dough, at 78% hydration, but it was easy to handle with lightly floured hands. The dough had nice extensibility but excellent strength. The pre-shaped pieces and shaped loaves held their shapes very well. I could not say that the longer cold retardation resulted in any problematic gluten degradation. The crumb was as expected with this bread. There was no evident effect from the longer retardation. The flavor, on the other hand, was distinctly tangier. 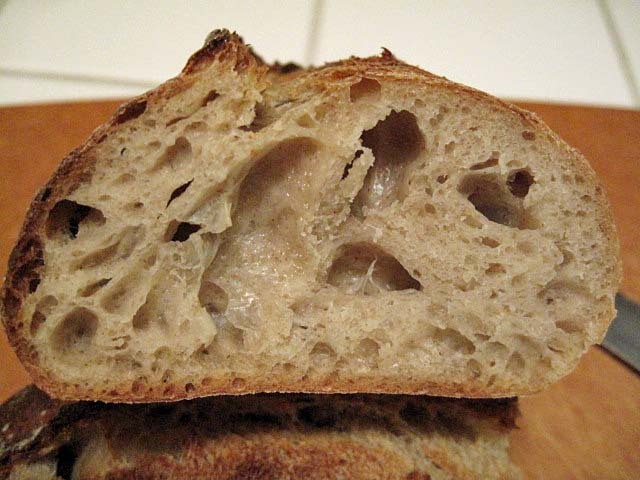 The initial flavor was the lovely, complex flavor of the San Joaquin Sourdough. The moderate sourness came through a bit later, and the flavor lingered on the palate for an exceptionally long time. I would certainly recommend trying this version to any who have enjoyed the San Joaquin Sourdough before and favor a more assertive sourdough tang to their bread. Another great bake! I am playing with longer cold fermentation time as well, so far so good! Hmmm ... The outside temperature here has hovered around 107ºF for the past several days. I wonder if I'm just looking for vicarious cooling. Anyway, the bread is improved, to my taste, with the longer cold retardation. Hi David! They look awesome! They look awesome! The starter you're using in your levain is kept at 100% hydration? Many people have said the longer you keep your dough in the refrigerator the tangier it will be... I guess you liked it! Thanks for sharing your recipe.... I've been baking in this heat - all my doughs been rising too quickly! I generally keep my stock starter in the fridge at 75% hydration. I then adjust the hydration according to the formula I'm using when I feed the starter before mixing the final dough. I'm going to try making it tonight! Thank you for posting this recipe! Let us know how it turns out, Margie! gorgeous loaves. I make this formula as my "go to" bread pretty often now. I get huge growth in the fridge over the 21 hrs that I have been letting it stay. I then take it out and shape and place in a cloth-lined basket. I usually have to leave it several hours in contrast to your timing to get the rise before baking. I don't preshape...not sure if that makes a difference. I just tuck it into a boule and drop it into the cloth. I have been baking mine in the cast iron pots. It has great expansion and really comes out nicely brown and crunchy crust. I appreciate your sharing your experience. Your boule is gorgeous! I think the important thing about this bread is that it get the full benefit of a long fermentation. That means both flavor development and CO2 development. As long as those happen, it may not matter at which stage what is accomplished. I get a lot of volume increase in the fridge only if I give the dough a "head start" at room temperature. I get most of the expansion during proofing and through oven spring. I look for little or no expansion during the 60 minute "rest" after pre-shaping, and I don't want more than a 50% volume increase during proofing, or it acts over-proofed in the oven. Proofing takes 30-45 minutes. I need to make clear that this is without an instant yeast spiking - pure levain-raised dough. I assume yours is the same. 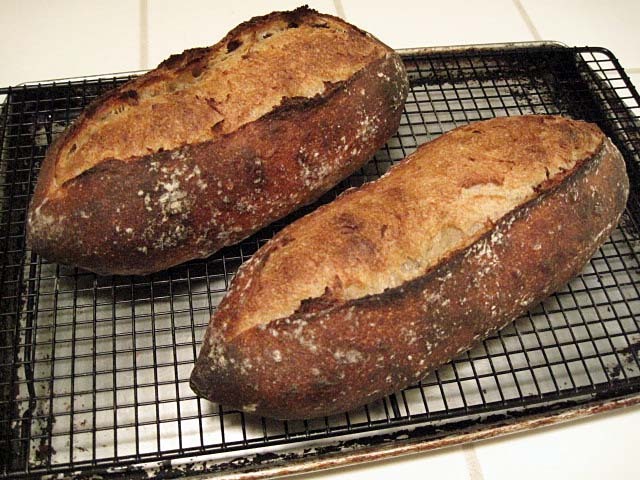 Terrific looking loaves---great crust, crumb and photos. levain only and no yeast. Thank you for the kind words. As I think on it I get huge rise in the fridge. I also note that it really wants to get rising during the s and f's and by the last one it is really raring to go when i get it into the fridge. Then when I take it out and don't preshape just plop it in the baskets I leave it about 2 hrs...your preshape time + rise....there is some rise but as you say not all that much. That's a really fantastic crumb, David, given the length of the retardation. I've been playing around with your Bouabsa sourdough formula, using a mix of AP, WWW, rye, and bread flours (ala DonD's suggestion) but shaping the dough into bâtards (I call it my Bouabsa goes rogue bread). Also used a 100% hydration levain rather than my standard very firm culture, since the timing is easier and I was curious about the difference in taste. The bread is good, rises beautifully, but am not getting as open a crumb as I'd like. Not sure if that's due to my handling or maybe underproofing, or both. Your bread is so nice I think I'll take a break from my own experimentation and give your updated formula a try. As you probably recall, the SJ-SD evolved from the Bouabsa baguette formula. I've made this 3 times now using a liquid levain. I know we are supposed to get more acetic acid from a firmer levain, but I think the liquid levain is giving me more tang. If you make the SJ SD with mods, please let me know how you like it. I've been using 150 g BF, 300 g AP, 25 g each of WWW and rye, and around 370 g water. The first time I made your Bouabsa sourdough formula, I used KAF French style flour. That flour is pretty amazing and as you noted, the windowpane was fantastic after doing the S&Fs. Divine taste and beautiful open crumb. As much as I like KAF's French flour, it's a bit pricey at $10 for 3#, which is why I tried the mix suggested by DonD. Will drop the WW the next time I mix it - and most certainly will try your amended formula as that lengthy cold retardation comes in handy for midweek baking. Appreciate your sharing it. I don't recall anyone baking the SJ SD in a WFO before. I'm looking forward to hearing about your results. I'm just wondering if I'm not the only one that noticed that the flour in the starter is not counted into the overall flour of the recipe. Is that the way recipes are supposed to be formulated? Because the overall salt of this recipe drops to around 1.8% I think rather than the 2% its supposed to hit. There are a number of ways of formatting a bread formula. The way I chose has all the information you need to make the bread. There are two builds: the final levain build and the final dough build, in which the levain is regarded as one ingredient. A more complete picture would list the ingredients and their weights and baker's percentages in the total dough as well. This has the advantage of providing the true baker's percentages, since the water and flour in the levain would be added to those constituents in the final dough. So you are correct, except I would quibble with your choice of the words "supposed to." There are not "rules," there are only conventions, and these are multiple. Thanks, David. I guess that I just have been using true percentages and find the other types strange. My fault, but now I have a better understanding. I mean it, Thanks! I started baking bread about one year ago. I started a sourdough starter about two months after that. 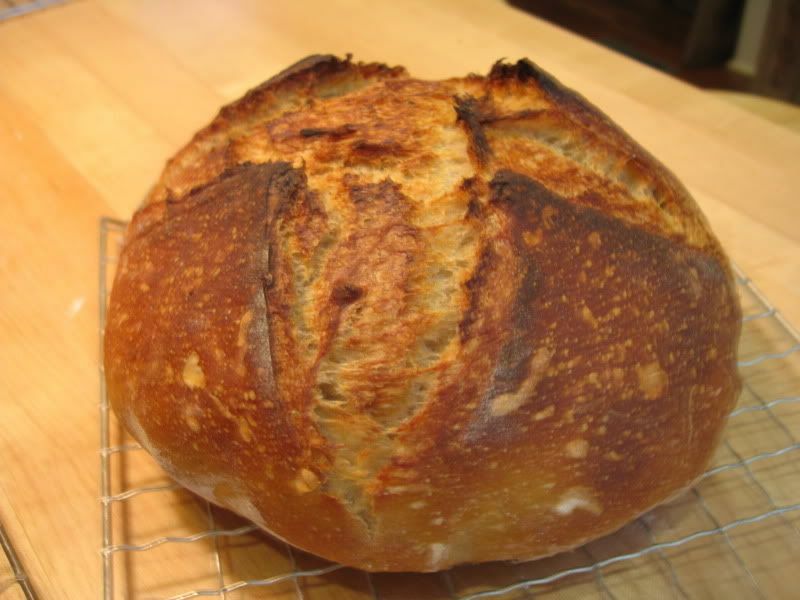 I have baked your San Joaquin sourdough a number of times now--my favorite bread. However, my wife has been wanting a sour tang in the bread. I have managed to obtain sourness by bulk fermenting and proofing in a warm oven. My problem with that method is that I could not obtain consistency in sourness. Sometimes the bread was mildly sour and sometimes way too sour. I finally have a recipe that satisfies my wife! Happy wives are good to have! Thanks for sharing your success with the SJSD. Using a rye sour definitely would increase sourness. I also find that retarding a white starter for 24 hours after it's ripe before use increases the sourness of the bread. I know this violates the general rule to use a starter when it's at its peak activity, but it works for me. I have been working on an all white sourdough with an assertive sour flavor. Do you bring the starter back up to room temperature before using? It depends on when I last fed the starter. If I have refrigerated it, I may mix the dough using warm (80 degrees F) water. If I don't, it just results in a slower, longer fermentation, which isn't a bad thing.